Ivanka Trump at an American Technology Council roundtable with corporate and education leaders at the White House in June 2017. Photo: PA Images. 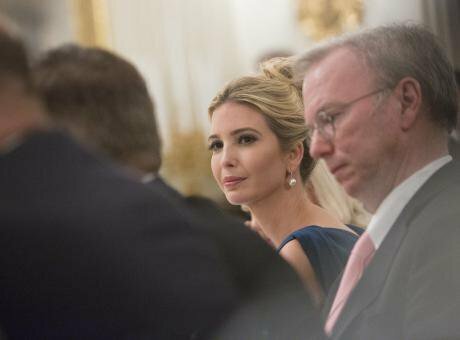 All rights reserved.The media backlash to Ivanka Trump’s recently published book, Women Who Work, was immediate. A New York Times review put it this way: ‘Ivanka Trump Wrote A Painfully Oblivious Book for Basically No One’. Of course, it was an easy target for criticism. The book opens with Trump’s memory of soul-searching during an adventure holiday in Patagonia and includes laments about having been too busy to have massages during her father’s Presidential campaign. It’s hard to forget that the author is the highly-privileged First Daughter of one of the more cartoonishly sexist political figures of recent years. Trump’s book is, however, not so unique in the context of American “self-help culture” which encourages individuals to define themselves on the basis of ‘core values’ like entrepreneurship, self-reliance, the right to happiness. Women Who Work is but one contribution to an ever-expanding US self-help industry, worth an estimated $11 billion. It fails to offer anything new in terms of advice to women. Rather, it is just the latest reflection of ‘neoliberal feminism’. This is mainstream, American feminism today: seductive, easily digestible, and always subordinate to the requirements of neoliberal economics. It is a fatally weakened feminism. Copies of Sandberg's book on a table at a 2013 conference in Germany about women in executive positions. Photo: Angelika Warmuth/PA Images. All rights reserved. 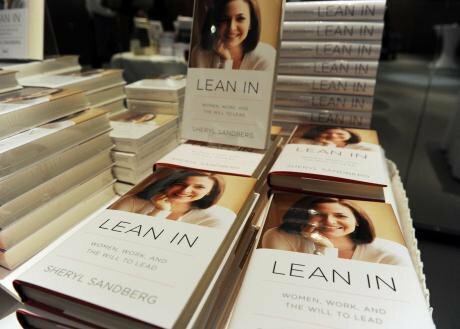 Before Women Who Work, there was the wildly successful book Lean In (2013), by Facebook CEO Sheryl Sandberg. Trump quotes extensively from this book in her own. While the books have differences – Lean In, for instance, admonishes men for not doing their equal share of housework, and gives more space to work-life-balance policy questions – their central messages are strikingly similar: that women can end gender inequality, if they only break through psychological barriers holding them back. Lean In asks “what women would do if [they] weren’t afraid?” and claims “we hold ourselves back in ways both big and small, by lacking self-confidence, by not raising our hands, and by pulling back when we should be leaning in”. Women Who Work beseeches us to “live out of [our] imagination, not [our] history” and tells us that “when you're passionate and you work hard, you can achieve great things”. These messages appeal on an emotional level. Like 7 Habits of Highly Effective People – the widely popular self-help book from the late 1980s, quoted extensively in Trump's book, which urged readers to approach life with an “abundance mentality” – Lean In and Women Who Work assure women that success is just around the corner if they want it. We just need to demand more, negotiate starting salaries with self-confidence, take more time for self-care, admonish our partners if they fail to do their fair share of housework. The problem lies in what this neoliberal feminism skims over, and the behaviours it promotes as a result of these omissions. It focuses on equality before the law, with both Women Who Work and Lean In paying tribute to previous generations fights’ for legal parity, and presenting the struggle for gender equality as now largely down to the individual, who must ensure that she makes the most of the opportunities available to her. This downplays structural barriers to success. Take the issue of care work which is still disproportionately carried out by women. Without institutional support, it is impossible for people with caring responsibilities to “lean in” the way that people without such responsibilities can. Female empowerment is impossible without challenging workplaces that take the ‘unencumbered’ individual as the standard. Within neoliberal feminism, these issues are subsumed within the general idea of ‘personal improvement.’ As academic Wendy Larner has noted, neoliberalism is more than policies aimed at promoting privatisation or fiscal austerity – it is a new way of thinking about, and regulating, the self, with good citizens seen as “individualised and active subjects responsible for enhancing their own well-being”. In other words: it is up to you, the individual, to succeed. Since becoming a single mother in 2015, Sandberg has publically acknowledged that Lean In did not dedicate enough space to “the difficulties women face when they have an unsupportive partner or no partner at all”. Today Facebook is supposedly one of the most family friendly workplaces in the US, with generous parental leave provisions and additional perks like breast-feeding rooms in its Menlo Park headquarters. But most women do not get the chance to work at Facebook. But most women do not get the chance to work at Facebook. This is another core flaw of neoliberal feminism: its failure to contend with hierarchies of privilege among women. While the American dream promises equal opportunity, economic inequality is higher, social mobility lower, and worker’s rights significantly less developed in the US than in any other developed country. Many jobs women do in America are low-paid, exploitative and fail to provide basic economic security, never mind the sense of ‘life purpose’ described in Women Who Work. Ivanka Trump’s book fails to reflect on the privilege that helped her find ‘fulfilling’ work. It pays only superficial tribute to childcare workers that have enabled her to put in such long hours at the office, only mentioning them once in the text (“some of my best photos of the kids were taken by my nanny”) and once in the acknowledgements. Hundreds of thousands of American women must balance their own caring responsibilities with long hours in the homes of wealthier women, cleaning, cooking, and looking after their children and family members. Any worthwhile feminism has to engage with this reality: that the success of privileged women often rests on the work of women who are less privileged. Neoliberal feminism promises freedom, but it just replaces one source of coercion (traditional, patriarchal authority) with another (the market). In this new world, women’s disadvantage may be defined less by gender and more by class. Production and the opiate of endless consumption become the ultimate signifiers of female empowerment and personal value. This threatens feminism’s promise to transform women’s lives. Self-help books and ad campaigns and TV shows that endlessly reproduce the individualistic ethos of neoliberalism also actively undermine the development of solidarity between women. There is no need for sympathy if all you need to do is ‘lean in’ – and without this sympathy, the political impetus for structural reforms vanishes. These, then, are the problems with Ivanka Trump's Women Who Work: it talks about female empowerment but defines success in terms that serve the interests of men and the rich; it values individual success over collective justice; it legitimises the outcomes of structural oppression. What must we learn from all of this? A feminism that is a handmaiden to capitalism isn’t feminism at all.